Abstract: In 1960, the Mexico-based German artist Mathias Goeritz (1915-1990) debuted his Messages: nineteen abstract, wall-mounted assemblages that sit uneasily between painting and sculpture, Mexico and Europe, and secular and non-secular concerns. 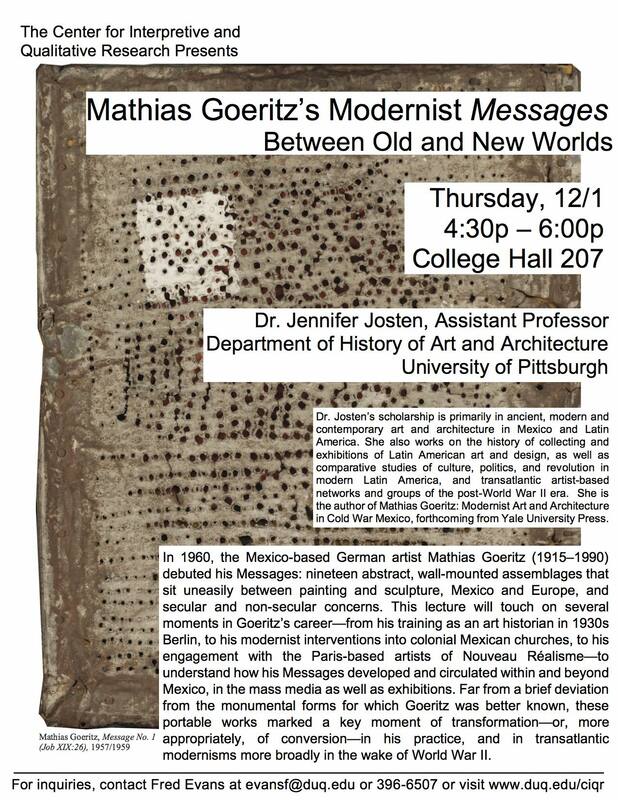 This lecture will touch on several moments in Goeritz's career-- from his training as an art historian in 1930s Berlin, to his modernist interventions into colonial Mexican churches, to his engagement with the Paris-based artists of Nouveau Réalisme-- to understand how his Messages developed and circulated within and beyond Mexico, in the mass media as well as exhibitions. Far from a brief deviation from the monumental forms for which Goeritz was better known, these portable works marked a key moment of transformation-or, more appropriately, of conversion-in his practice, and in transatlantic modernisms more broadly in the wake of World War II. Bio: Dr. Josten's scholarship is primarily in ancient, modern and contemporary art and architecture in Mexico and Latin America. She also works on the history of collecting and exhibitions of Latin American art and design, as well as comparative studies of culture, politics, and revolution in modern Latin America, and transatlantic artist-based networks and groups of the post-World War II era. She is the author of Mathias Goeritz: Modernist Art and Architecture in Cold War Mexico, forthcoming from Yale University Press.